If you are entry level into camping/outdoors, then this product could be useful for your charging needs. It all comes in a robust, and not too heavy casing, and is easy to carry with a sturdy handle. We charged up the battery from our home, and that took around 36 hours to fully charge for the first time. We then ran one of our 1amp camping lights, and found that the battery kept the light going for 11 hours, which was what we expected. This would get us through 2 nights at camping without charging. When we tried to charge from the solar panel - no luck. The panel is too small to be effective and did not charge the battery significantly for use. I don't see the point of having it on the pack (except to hide the on/off buttons and sockets?) We did try to charge our own devices using this panel, but we were unsuccessful. Additionally, we tried to use our own standalone solar panel to charge the battery - it did not work. Our solar panel comes with a regulator, so make sure you use one before connecting. So the only reliable method we personally found is via charging from a powerpoint - that was the way we were able to achieve full charging capabilities. To charge from a solar panel requires the solar panel to be fitted with a regulator. The TITAN certainly recharges perfectly from the 20W Sun Hawk panel, which has among other features a smart charge regulator. Hence, the statement that the TITAN can only be charged from mains is completely inaccurate. It is possible to charge from main, DC and solar. 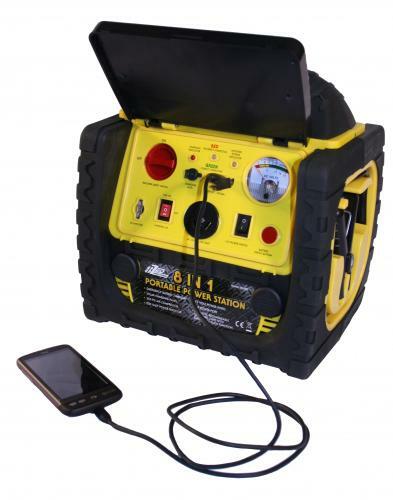 The air compressor will pump up your bike tyres, inflatables or maybe add some air to your non 4WD tyres, but use of the compressor isn't designed for serious 4 WD enthusiasts. It would be handy around the house in summer when you have paddling pools etc that need pumping up. USB ports are a great addition to this – charge your mobile phones, handheld gaming devices etc. This was a big plus for us. 2 12v DC sockets are beneficial as well. The torch (magnetic so it stays in the pack when not in use) is good for light use around the home and campsite but does not provide enough wattage to really cook by, or go walking. There is an emergency flashing function with it (orange lights) which my kids enjoyed playing with but would be unlikely to use it in event of an emergency, as the lights are not that bright. This function is very basic. Jumpstart - very handy to have if you don’t have cables and want to be able to jumpstart own car without calling for assistance. We did not use this feature. Recommended for: people who don’t do a lot of camping but want something easy to charge at home, and provide light and some extra power at your campsite for 1-2 days. Those people like us, who camp regularly, might find this product limiting. Our Thumper battery is more powerful and whilst may not have some of the functions listed above, we have alternatives to these functions already. So for an overnighter trip – this would be fine, but anything longer, and we would need to take our own battery.